General Rubber manufactures standard and custom expansion joints in a large range of sizes, materials, and arrangements. Our modern, U.S.-based and ISO 9001/14001 certified manufacturing facility has a large capacity and can complete many large-scale projects simultaneously. Based in the United States, General Rubber proudly manufactures performance rubber expansion joints (REJs), ranging from one inch up to twelve feet in diameter, and in standard and custom arrangements. For decades we have been fine-tuning our manufacturing process to ensure the delivery of quality, domestically produced products, with competitive lead times and pricing. After more than 65 years we continue to improve our processes, streamline our production, expand our innovative product lines, and challenge the limits of manufacturing capabilities. General Rubber was the first rubber expansion joint manufacturer to receive the ISO 9001 and 14001 certifications for quality management systems and environmental management systems respectively. General Rubber maintains a superior manufacturing methodology that is both efficient and environmentally conscious. We offer products in a wide range of performance materials including, for example, EPDM, Neoprene, Teflon, Viton/FKM, Chlorobutyl, Kevlar, and Polyester tire cord. We manufacture hand-wrapped REJs with customized tooling that allows us the flexibility to create custom REJs to any field conditions, including all-directional offsets. In addition to our standard styles, we also offer advanced custom arrangements. From our pressure balanced joints to our one-of-a-kind dismantling joint applications, we have considerable experience in unique and large-diameter expansion joints. 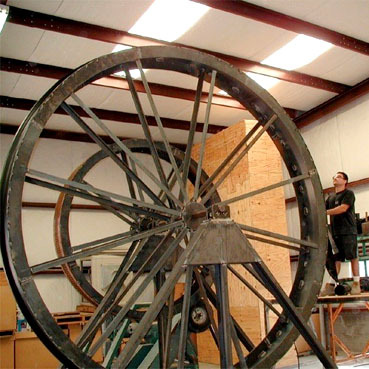 Our manufacturing capabilities extend beyond our actual products and include traditional and advanced testing equipment and capabilities, in addition to innovative shipping and crating options. Please contact us for your unique applications or to find out more about our manufacturing facility, fabrication experience, and capabilities.